These photos were taken in Isla Mujeres, Mexico which is an all snokel event. No diving or photography using strobes are allowed. The whale sharks here are protected and requires a Mexican guide and only two persons in the water at a time which we called a jump. Thus, we took turns doing jumps in the water to be with these magnificant fish. No touching and only admiration and photography was allowed which is the way it should be. 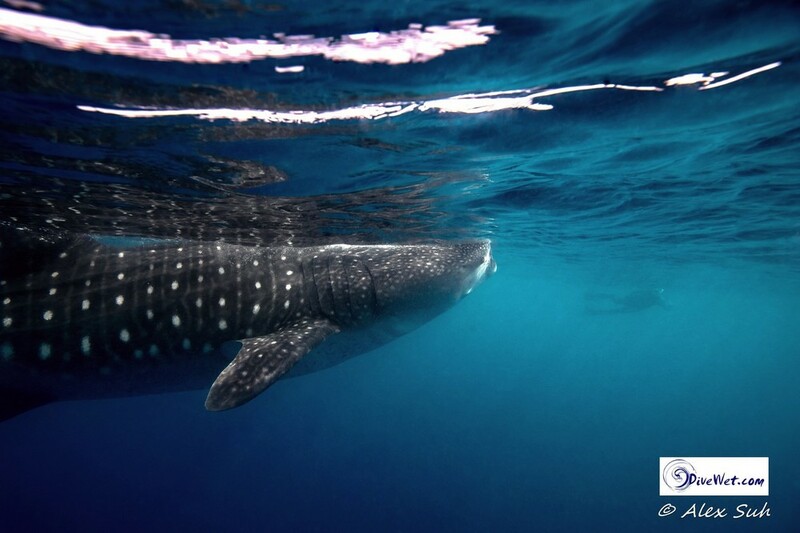 Unfortunately, you could see signs of damage to some of the whale shark from scraping caused by the propeller of boats which were likely fishing boats since the boats that were out there were trained guides and licensed and monitored by the Mexican government. 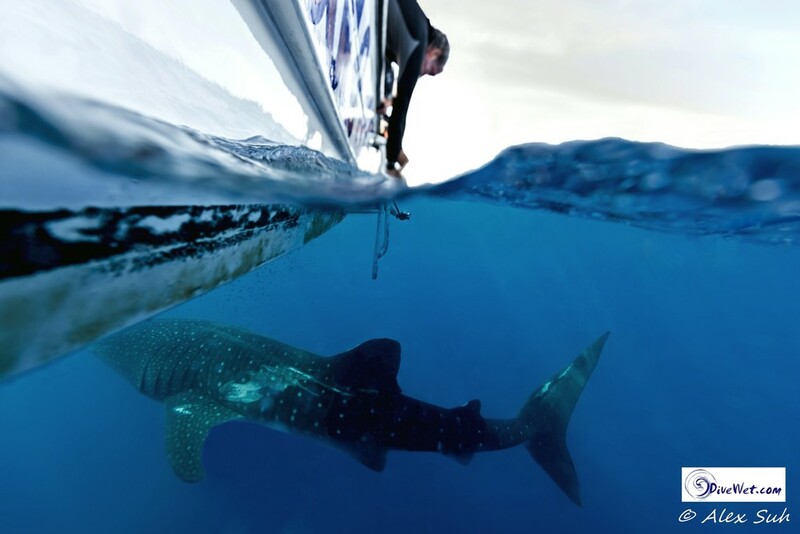 In the one of the over/under photos above, where my Italian friend, Carlo Zuffetti, was leaning over to film with his Go Pro, you can see the side and tail of the whale shark had been scraped by what appeared to be from a propeller. Many of the photos are not as clear as I would like which is caused by the fish eggs and plankton in the water which the whale shark feed on which is why they appear cloudy or spotty at times. The whale shark (Rhincodon typus) is a slow-moving filter feeding shark and the largest known extant fish species. The largest confirmed individual had a length of 12.65 m (41.50 ft) and a weight of more than 21.5 metric tons (47,000 lb), and unconfirmed reports of considerably larger whale sharks exist. Claims of individuals over 14 m (46 ft) long and weighing at least 30 mt (66,000 lb) are not uncommon. The whale shark holds many records for sheer size in the animal kingdom, most notably being by far the largest living nonmammalian vertebrate, rivalling many of the largest dinosaurs in weight. It is the sole member of the genus Rhincodon and the family, Rhincodontidae (called Rhiniodon and Rhinodontidae before 1984), which belongs to the subclass Elasmobranchii in the class Chondrichthyes. The species originated about 60 million years ago. 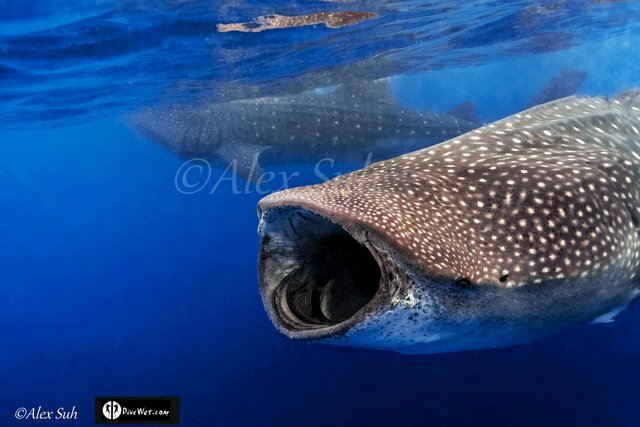 The whale shark is a filter feeder – one of only three known filter feeding shark species (along with the basking shark and the megamouth shark). It feeds on macroalgae, plankton, krill,Christmas Island red crab larvae  and small nektonic life, such as small squid or vertebrates. It also feeds on small fish and the clouds of eggs and sperm during mass spawning of fish. The many rows of vestigial teeth play no role in feeding. Feeding occurs either by ram filtration, in which the animal opens its mouth and swims forward, pushing water and food into the mouth, or by active suction feeding, in which the animal opens and closes its mouth, sucking in volumes of water that are then expelled through the gills. In both cases, the filter pads serve to separate food from water. These unique, black sieve-like structures are presumed to be modified gill rakers. 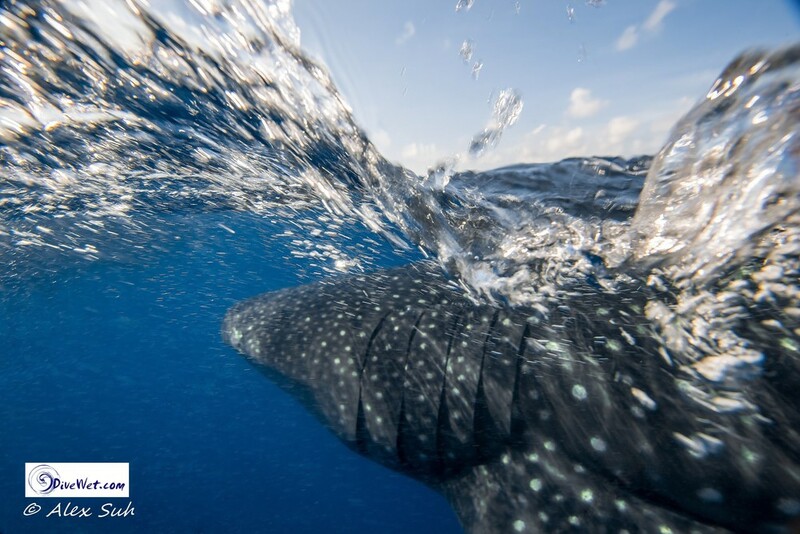 Food separation in whale sharks is by cross-flow filtration, in which the water travels nearly parallel to the filter pad surface, not perpendicularly through it, before passing to the outside, while denser food particles continue to the back of the throat. This is an extremely efficient filtration method that minimises fouling of the filter pad surface. 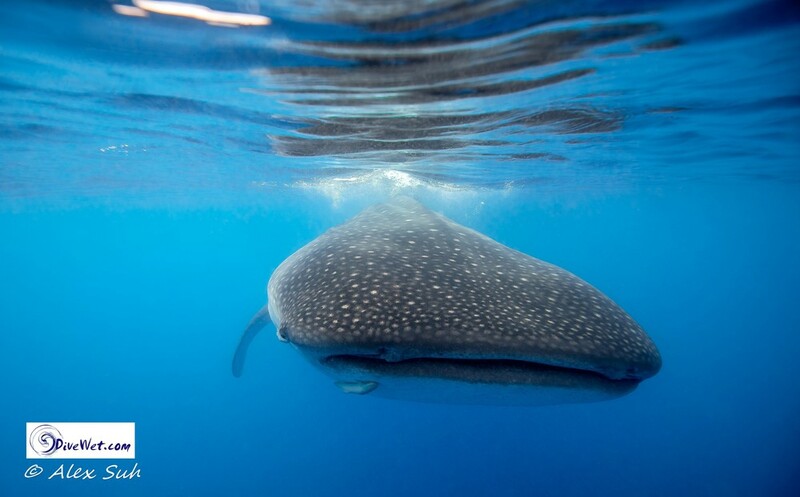 Whale sharks have been observed "coughing", presumably to clear a build-up of particles from the filter pads. 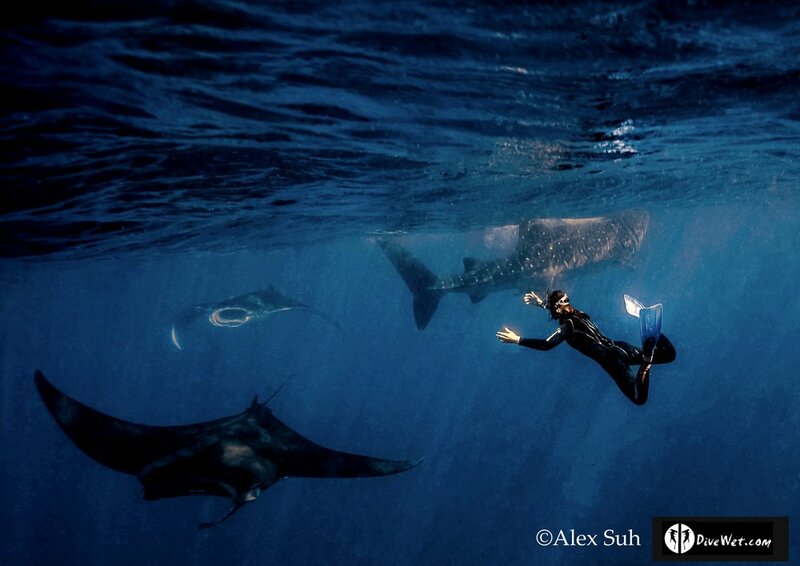 Whale sharks migrate to feed and possibly to breed.